Not much seems to have changed for Aparajita Sarangi since she quit the Indian Administrative Services in September last year to join politics. At 9 am, when ET caught up with her, she was in office, getting feedback from a group of Bhubaneswar housewives who have launched a volunteer campaign, ‘Mun bhi Aparajita’ (I too am Aparijita), although she had returned home at 2 am after slum visits and late night meetings. In an hour, the 49-year-old mother of two headed out to Khorda for a day-long padyatra through seven villages for a BJP MLA aspirant. There she seemed as at home as the local MLA aspirant. 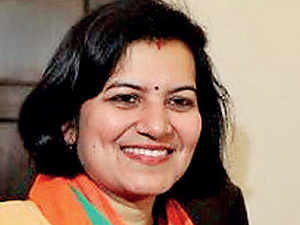 The 1994-batch officer IAS, who last served as Joint Secretary in the Ministry of Rural Development, is the Bharatiya Janata Party’s candidate for the Lok Sabha seat of Bhubaneswar. Sarangi has an enviable reputation in the state as an honest and hard-working administrator back from her days as Commissioner, Bhubaneswar Municipal Commission (BMC), and secretary of the state’s mass education department. Getting vendors under streamlined rows of shops and covering the city’s walls in traditional Saora-style paintings, Sarangi changed the face of the city. In those days the young bureaucrat, married to a fellow Odia IAS officer, would be spotted supervising the sweeping of the city streets at dawn. Ever since she turned politician, joining the party not at the party headquarters in the state but at BJP President Amit Shah’s residence in Delhi, Sarangi’s moves have been closely followed. That she meant business was evident when she was secretly filmed telling party workers she didn’t care for factions, and camps, the party came before everything else. On any given day, she’s either at a city park, or a slum, or is on a padyatra in one of the thousands of villages that surround Bhubaneswar. On this particular padyatra Sarangi seems just as familiar as the local MLA aspirant. “I was collector here during and after the super-cyclone of 1999,” she explains. Surrounded by a hundred local leaders and supporters – all men – Sarangi goes around seeking, not their vote, but information about their issues and aspirations. A teenager tells her she’s completed a tailoring course. “Have you got a machine? We must get you one, and help you in marketing what you make. Look up, look at my eyes when you talk to me, don’t be shy,” she says. When she spots two women trying to get a picture from behind a door, she crosses the threshold to talk to them. A school-going girl is thrilled to get a selfie. As the crowd moves on, her mother recalls how Sarangi as secretary of the school and mass education department enforced uniforms for school teachers to address teacher absenteeism. She also set up a hotline for students to complain against corporal punishment, some of these youngster will be first time voters in the simultaneous polls next month. Sarangi, daughter of an English professor says she didn’t contemplate a political career until recently. She was a student leader, but not affiliated to any political party. As her deputation with the Centre was coming to an end, she contemplated her return to the state and realised she could no longer look at Odisha the same way. “If I had sought an extension with the Centre, I’d still be limited to one ministry. I wanted a larger canvas than one department,” she explains. “My father used to say, it is better to light a single lamp than curse the darkness. People like to stand outside and say politics is dirty, but that will not change the system,” she says. The BJD, on the other hand, is a regional party without a vision according to Sarangi. “Had I not visited 25 states and 450 districts during the five years I was with the Centre I would have remained a frog in a well. Now I can’t help asking why political stability of twenty years and a majority government hasn’t placed Odisha among the most progressive states in the country,” she says. “I’ll be honest, its leader didn’t inspire me,” she adds.